Even as the backers of a project to build an Islamic community center and mosque celebrated a key planning decision in their favor, a conservative advocacy group founded by the Rev. Pat Robertson vowed to challenge the city panel's vote in state court. Plans for the controversial mosque near ground zero were advanced forward as a city panel opened the way for developers to tear down a building that was struck by airplane debris on Sept. 11. Brett Joshpe, an attorney for the American Center for Law and Justice, said the group would file a petition alleging that the city's Landmarks Preservation Commission "acted arbitrarily and abused its discretion." The panel voted unanimously on Tuesday to deny landmark status to a building two blocks from the World Trade Center site that developers want to tear down and convert into an Islamic community center and mosque. The panel said the 152-year-old lower Manhattan building isn't distinctive enough to be considered a landmark. Oz Sultan, a spokesman for the developers, said they had no comment on the possible legal action by the ACLJ. But he said the developers were grateful for the decision by the landmarks panel. "We're very happy it's moving forward," he said. The decision drew praise from Mayor Michael Bloomberg, who stepped before cameras on Governor's Island with the Statue of Liberty as a backdrop shortly after the panel voted and called the mosque project a key test of Americans' commitment to religious freedom. "The World Trade Center site will forever hold a special place in our city, in our hearts," said Bloomberg, a Republican-turned-independent. "But we would be untrue to the best part of ourselves, and who we are as New Yorkers and Americans, if we said no to a mosque in lower Manhattan." The vote was a setback for opponents of the mosque, who say it disrespects the memory of those killed at the hands of Islamic terrorists on Sept. 11, 2001. Jeers and shouts of "Shame on you" could be heard after the panel's vote. The proposed mosque has emerged as a national political issue, with prominent Republicans from former Alaska Gov. Sarah Palin to former House Speaker Newt Gingrich lining up against it. The Anti-Defamation League, the nation's most prominent Jewish civil rights group, known for advocating religious freedom, shocked many groups when it spoke out against the mosque last week. 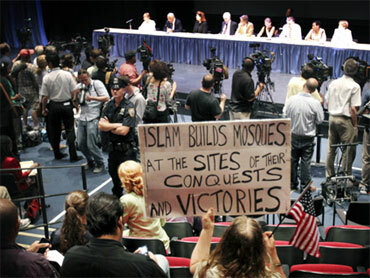 Former Rep. Rick Lazio, a Republican running for governor of New York, attended the commission meeting with a handful of opponents of the mosque, which is being developed by a group called the Cordoba Initiative. Lazio said the group's imam, Feisal Abdul Rauf, had refused to call the Palestinian group Hamas a terrorist organization. Rauf also said in a "60 Minutes" interview televised shortly after Sept. 11 that "United States policies were an accessory to the crime that happened." Former New York City firefighter Tim Brown told CBS News Correspondent Jim Axelrod that he wants to know where the money for the mosque is coming from, believing Rauf has ties with extremists. "We have seen through him," Brown told CBS News. "He's a bad guy." The Cordoba Initiative says on its website that its goal is to foster a better relationship between the Muslim world and the West. "We believe it will be a place where the counter-momentum against extremism will begin," the imam's wife, Daisy Khan, told The Associated Press on Friday. "We are committed to peace." The commission's decision not to designate the existing building as a landmark means that the developers can tear it down and start from scratch. If the building had been declared a landmark, they could have created a smaller mosque and community center there. A partner in the project, SoHo Properties, bought the property for nearly $5 million (euro3.8 million). Early plans call for a 13-story, $100 million Islamic center with a swimming pool, basketball court, auditorium and culinary school besides the mosque. The center, called Park51, also would have a library, art studios and meditation rooms. A memorial will be dedicated to victims of the 9/11 attacks. Sultan, who is the media relations director for Park51, said there was no timeline for starting demolition or construction, which is expected take 18 to 48 months.